In triathlon, it’s commonly accepted that to go faster, all one needs to do is apply money to the problem. For the most part, this is true – we have special wetsuits that gain us time back on the swim, bearings and chain coatings from exotic materials, fragile tires and latex tubes, and wheels that cost more than the bikes we put them on. Speed is expensive, and more speed nearly requires making partner at a law firm, but maybe it doesn’t have to be that way. 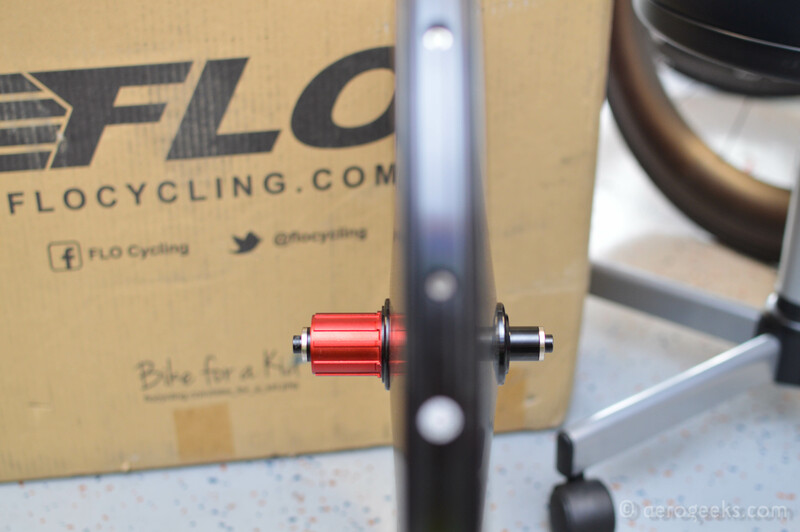 Companies like FLO Cycling are changing the game, bringing big speed down to mere mortals, and their disc offering is no slouch. FLO has been producing fast, high-quality wheels at bargain basement prices for a while, now, and their success has been fantastic to witness. Their direct-to-consumer, sell-as-they-arrive approach has paid off, both for them and for all those racing on their wheels. We have personally witnessed Chris and Jon Thornham take calls when incredibly busy, and bend over backwards to make sure their customers are well looked-after. This is not to say that this level of service cannot be provided by larger companies. Although it isn’t every day that we see the head of SRAM fielding problem calls from Zipp owners, as an example. Simply put, this kind of customer service speaks to FLO’s commitment to quality and the attention to detail that goes into their products. The DISC is no exception. It starts off with FLO’s alloy rim, laced in a 2-cross pattern (24 spoke) or 3-cross for the Clydesdales (28 spoke) among us, running their VORTEX hubs, and the whole package gets wrapped with non-structural 3k carbon fiber fairings, just like the 60 and the 90 wheels. The same 24.4mm rim width carries over, so wider tires fit without issue and blend well into the brake track for better aerodynamics, due to the straighter sidewall of the tire. The only differences are the use of Sapim Laser spokes instead of CX-Rays, and the full DISC fairing. 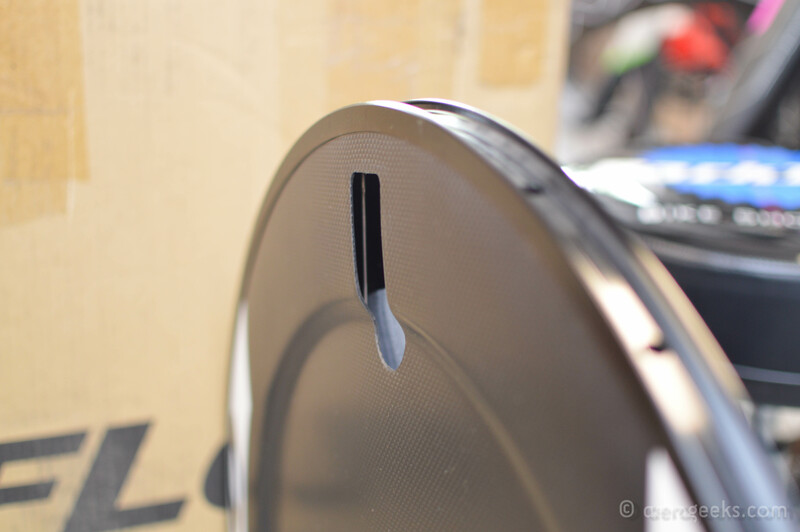 Said fairing is lenticular in shape, meaning that it widens out from the brake track as it descends, until tapering around 90-100mm into a secondary lenticular shape. This is a fancy way of saying that the DISC’s shape has a step to it, where it dips inwards a bit before widening again to meet the hub. 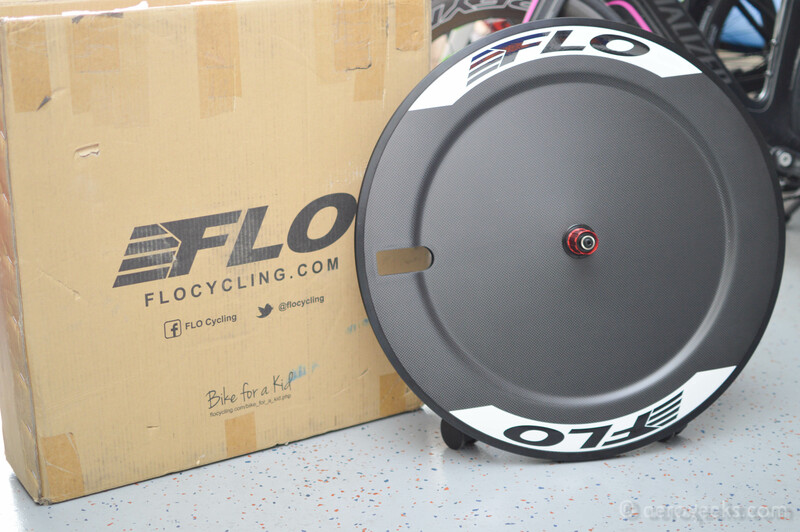 FLO says that the shape is the result of a massive amount of hours doing CFD modeling and testing, and the DISC is the fastest wheel they’ve ever made. Above is the proof of their claim, with the result that from 9 to 23.5 degrees, when paired with their preferred tire, the FLO DISC will produce negative drag, otherwise known as thrust. Simply stated, the disc is free speed—even a moderately windy course, and still faster than a 90mm rear on a dead-calm bike leg, too. 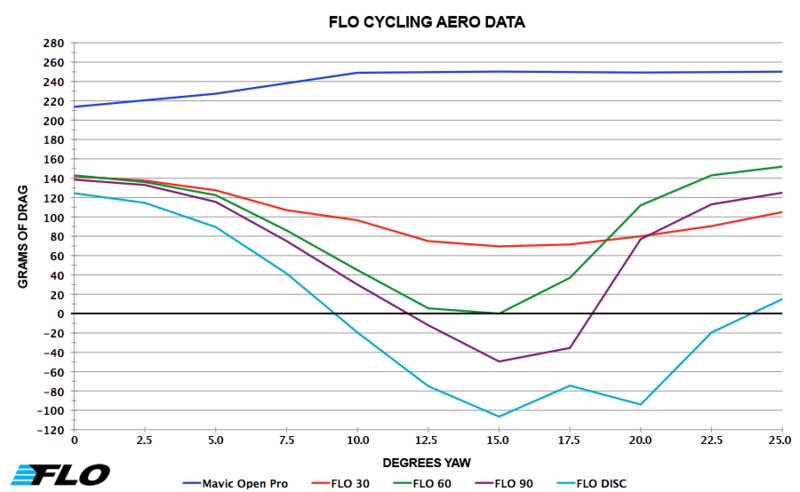 From a numbers perspective, if you can run a FLO DISC on race day, there’s no reason not to. And at $599, there’s absolutely nothing in the price bracket that tests this fast, either. 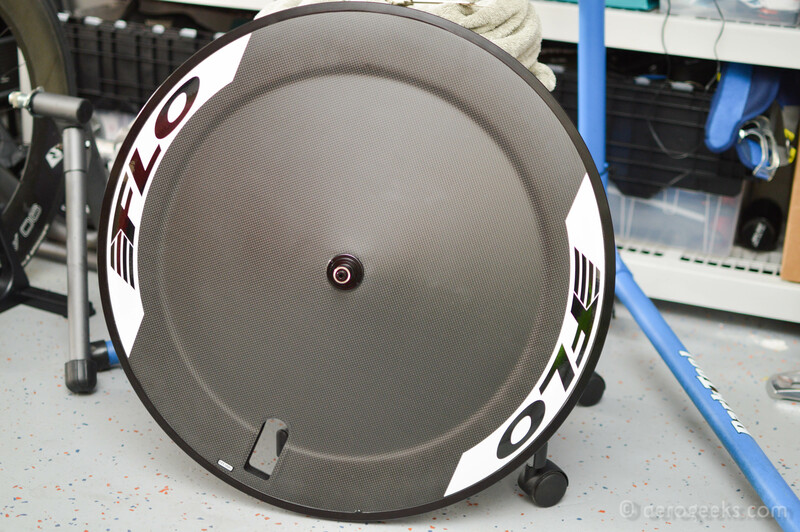 So what happens when you get the wheel out of the tunnel and onto the bike, numbers be damned? Magic. Some of us remember the first real aero bikes coming on the scene, our first ride with tubulars, or the first time we rode a deep carbon wheel, as well as the sensation of disorientating speed that accompanied it. Riding a disc is another milestone like that; your legs are turning the cranks at the same power with which they’re comfortable, but the Garmin is reading numbers that just don’t make sense. You notice the crosswinds playing with the rear of the bike, and how the push at the rear corrects for the front. Interestingly, unlike other discs, you do not get the familiar “whomp, whomp” sound from FLO’s offering. This is because the sound normally associated with discs is due to structural carbon reverberating from the drivetrain loading and unloading in time with your pedal stroke, whereas the DISC is structurally supported identically to a normal road wheel, but with a fairing over top. The noise you do get, however, is more like a drum head that’s a little bit loose. It’s a sort of constant, low rumbling that is by no means unpleasant, it’s just different. Is it different enough to warrant the several hundred (or, in a number of cases, thousands) extra in order to have the “traditional disc sound?” The all-carbon competitors are an order of magnitude more expensive, and if your bank account is anything like ours, we’d lean heavily towards the offering from the brothers Thornham and use the savings to invest in more upgrades that will make us faster, instead. Speaking of faster, let’s address the elephant in the room for just a minute and get into the discussion on which disc to buy. Discs, for the most part, have been pretty well understood from an aerodynamics perspective for a while, now. They’re about as fast as you’re likely to get, no matter which one you buy. Discs are fast, period. Buy the one you find offers you the most value for the money spent and be done with it. Yes, there are exceptions to this rule, such as those with wider brake tracks being slightly faster, but that’s a point inFLO’s direction (24.4mm wide), not away from it. There’s the choice of brake track, which is aluminum on the FLO DISC, so you don’t have to keep a separate set of brake pads around just for race day and your braking performance stays consistent with your training wheels. We found that the opening for the valve was large enough to accommodate our pump without an adapter, as well. VORTEX hubs are also fully serviceable with a couple of Allen keys, no special parts required. Further, at 1260g, it’s only 85g heavier than a Zipp Super9; a weight differential only worth mentioning due to the stark contrast in construction between the two discs. In truth, our estimation is that FLO’s real competition with respect to the DISC is the likes of Catalyst. At double the cost ($299 for the Catalyst vs $599 for the FLO DISC), the choice becomes one of philosophy. Is it worth the extra cost (nominal as it is in this sport) to have a dedicated race wheel that doesn’t require removing a cassette or putting a cover on and off every race? That’s a much more difficult question to answer than that of “but does it go, ‘Whomp whomp? '” We might argue that, long term, the FLO disc is going to be much more durable, and serve you better than a cover would. But then again, we could certainly see our way to either of the options. What FLO has done is to bring the absolute fastest wheel you can buy for the price to market, and that deserves to be talked about. If you’re shopping for a DISC and want a complete wheel that offers the best bang for the buck, the FLO DISC is where you should start, and end, your search. It is the very definition of Affordable Aero. I would be interested to see the comparison to a Zipp 808 FC only because that is what i currently ride. I have long debated the difference between the 808 rear wheel and a disc, be it a Zipp or Flo. From what many hours of googling can tell me i still dont see much difference. BTW, I like the article you posted last year about yaw. We reached out to FLO and unfortunately the data they have is limited to their own wheels. A wheel can’t apply force, so it’s not creating thrust. “Negative drag” as wheel makers like to call it, is lift, I think. It would be correct to describe the cycling industry’s definition of “negative drag” as “lift,” absolutely. Thrust is something of a misnomer, as what is really going on is a reduction in energy required to maintain speed at a given yaw with this wheel, which is a more complicated concept to explain. If we were to go into further detail, it would be something along the lines of “the FLO DISC is generating lift at yaw, which, given a constant power output, will result in a higher ground speed than would otherwise be experienced.” We certainly appreciate the correction, though – and we apologize for having been incorrect. Good catch! For further reading on the subject, check out a discussion between Andrew Coggan, Chris Thornham from FLO Cyling, and Tom Anhalt here on Slowtwitch. Also, this thread on Bikeforums.net and FLO’s own explanation on their blog. There are a lot of terms that might have been misappropriated over the years from aerodynamics over to cycling, and even we get mixed up now and again.